Illuminated Manuscript, Compendium of computistical texts, Above: Diagram of the harmony of the year and seasons; Below: Diagram of the harmony of the elements, seasons, and humors, Walters Art Museum Ms. W.73, fol. 8r, originally uploaded by Walters Art Museum Illuminated Manuscripts. Created in England in the late twelfth century, this manuscript was intended to be a scientific textbook for monks. The manuscript is brief at nine folios, and was designed as a compendium of cosmographical knowledge drawn from early Christian writers such as Bede and Isidore, as well as the later Abbo of Fleury. Those writers, in turn, drew on classical sources like Pliny the Elder for their knowledge, but adapted it to be understood through the filter of Christianity. The twenty complex diagrams that accompany the texts in this pamphlet help illustrate them, and include visualizations of the heavens and earth, seasons, winds, tides, and the zodiac, as well as demonstrations of how these things relate to man. 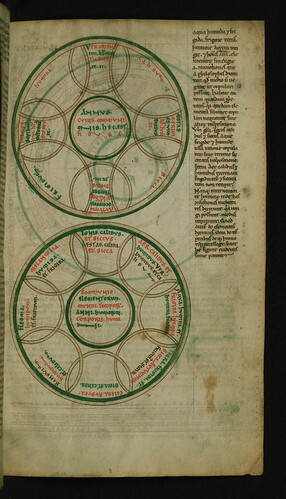 Although the exact grouping of texts and diagrams here is unique, the manuscript is related to other scientific compilations from this era, such as British Library, Royal Ms. 13 A.XI, Cotton Ms. Tiberius E.IV, and Oxford, St. John's College, Ms. 17.